The Decision, Risk, & Operations division is a world leader in Analytics, Operations and Management Science. It brings together a unique set of thought leaders with broad research interests. The division's research is typically focused on the development and analysis of quantitative and empirical models of business problems. 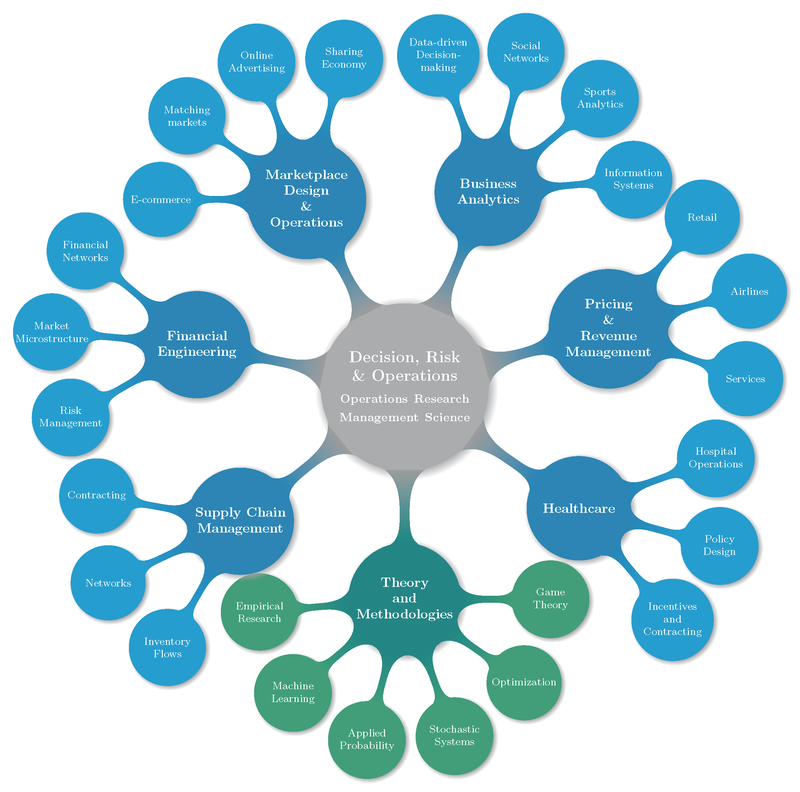 These models are used, for example, to support decision-making within organizations, to measure and manage risks, and to enhance understanding of business practices. The division's research develops and builds on state-of-the art methodologies from stochastic analysis, mathematical programming, game theory, probability, machine learning, statistics and econometrics. While the topics and application of the research can be broad, the group has a unifying culture of rigor and relevance. The faculty is regularly recognized through the most prestigious distinctions and awards in the field including, for example, NSF CAREER awards, INFORMS and MSOM fellowships, the Frederick W. Lanchester Prize, the Saul Gass Expository Writing Award, the INFORMS impact prize, the Erlang Prize, the Revenue Management and Pricing Section award, the MSOM young scholar prize. The division maintains strong ties with the Columbia’s School of Engineering and the Data Science Institute. An important aspect of the mission of the division is to foster collaboration with industry and impact society by solving important practical problems such as helping hospitals care for their patients in a more efficient and cost effective manner; optimizing logistics, coordination and risk mitigation in global supply chains; design of dynamic and responsive pricing algorithms in a variety of industries; creation of innovative securities trading algorithms; design of frameworks to measure systemic risk; and optimization of the operations of online marketplaces. Please visit the webpages of our individual faculty members to read through the latest research. The division brings cutting-edge knowledge to the classroom pertaining to the operations and analytics functions in firms. The division is actively involved in teaching in the MBA, Masters in MS&E and Business Analytics, and PhD programs. The Decision, Risk, and Operations Division at Columbia Business School is seeking to hire qualified faculty members for tenure-track appointments at the assistant or associate professor level, depending on the qualifications of the applicant. The Division has teaching responsibilities for management science, statistics, and operations management courses at the MBA and Ph.D. levels. Applicants for an associate professor level appointment should have a Ph.D. from an accredited institution, a record of scholastic achievement in both research and teaching, and should combine exceptional disciplinary training with a strong interest in the professional mission of the school. Applicants for an assistant professor level appointment should have, or be close to completing, a Ph.D. from an accredited institution, demonstrate promise of becoming an outstanding scholar in every respect, including research and teaching, and should combine exceptional disciplinary training with a strong interest in the professional mission of the school. Columbia Business School is particularly interested in candidates who, through their research, teaching and/or service will contribute to the diversity and excellence of the academic community. Candidates are encouraged to apply by October 15, 2018 in order to be considered before the annual INFORMS conference. Applicants should apply online at https://academicjobs.columbia.edu/applicants/Central?quickFind=66770. The Financial and Business Analytics center at the Data Science Institute at Columbia brings faculty across the university to develop analytical and computational tools to manage risk and to support decisions using the growing volume and variety of data available on the Internet and elsewhere. The Deming Center promotes operational excellence in business through the development of research and best practices and fosters collaborations with industry partners. The Center for Pricing and Revenue Management is a joint initiative between Columbia Business School and Columbia's Fu School of Engineering. The center encourages interdisciplinary research, collaboration, and information exchange among faculty members, students, and industry professionals who use and supply analytic approaches to pricing and revenue management. The Computational Optimization Research Center carries out advanced studies in the solution of difficult, large-scale optimization problems, with special focus on state-of-the-art implementation of modern algorithms. The Center for Applied Probability provides an umbrella under which diverse research and educational activities in probability and its applications can be focused and supported. The Industrial Engineering and Operations Research department is a department that has close ties with DRO in terms research interests. The Center for Financial Engineering is part of an interdisciplinary field of research where contributions from applied mathematics, economics, operations research, statistics and computer science have given birth to remarkable developments in market practice.